Selenium functions synergistically in the body with vitamin E as a potent antioxidant, preventing the oxidation of lipids (fats). It is an essential co-factor for glutathione peroxidase, an important antioxidant enzyme that protects the cellular membranes of every cell in the body. Selenium may help to support immune function and plays an important role in protecting and maintaining the function of vital body organs such as the heart, liver, lungs, pancreas and thyroid glands. Individuals on a poor diet, the elderly, pregnant women, smokers, vegetarians and vegans may have an increased dietary requirement for selenium. Vega Base™ (Acacia Gum, Fruit Juice Concentrates (Aronia, Apple, Elderberry, Blueberry & Blackcurrant)), Vegetarian Capsule Shell (Hydroxypropyl Methylcellulose, Colours (Titanium Dioxide, Copper Chlorophyllin)), Anti-caking Agent (Magnesium Stearate), Dicalcium Phosphate, L-Selenomethionine. Adults: Take 1-2 capsules daily with food or as directed by your healthcare practitioner. 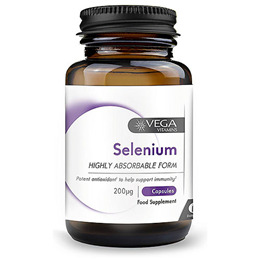 Below are reviews of Vega Vitamins Selenium - 60 x 200mcg Capsules by bodykind customers. If you have tried this product we'd love to hear what you think so please leave a review.